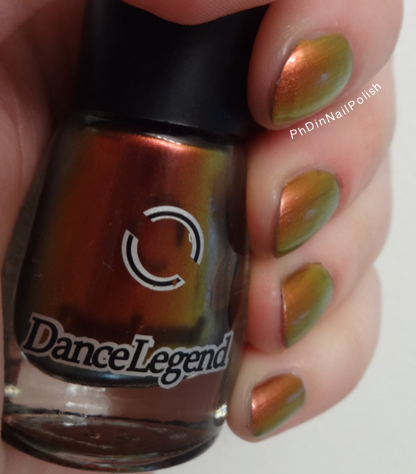 Today I have swatches of “Boo”, from the Dance Legend Chameleon Collection. All of the polishes in the collection are inspired by characters from the movie Monsters, Inc., which I think is adorable. 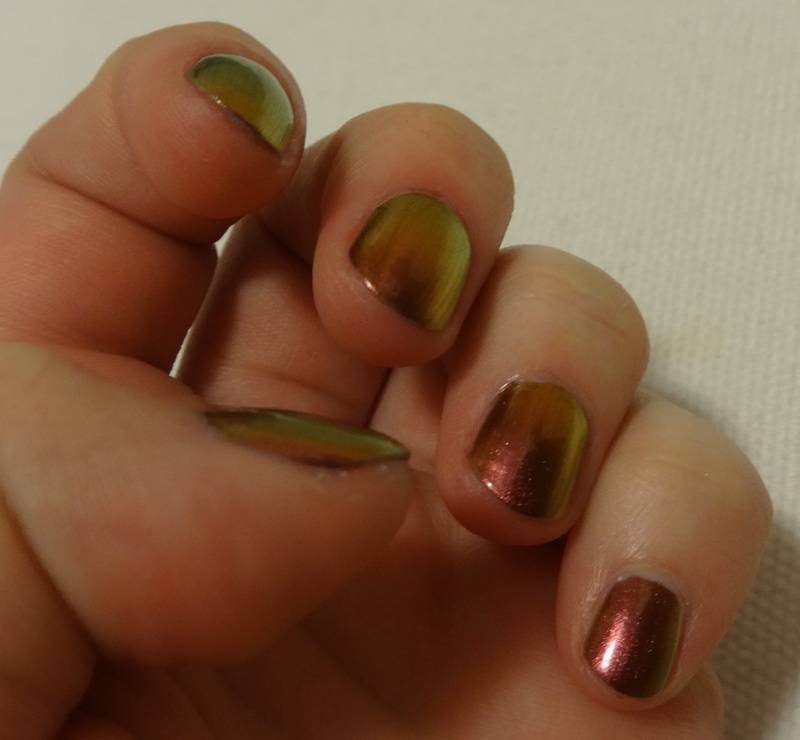 Plus, they’re all super shifty duo- and multi-chromes. Because I am a veritable bastion of self-restraint (also because I was not fast enough at the all-out war that is a Llarowe restock), I only have one from the collection: the green-red-orange shifting Boo. Since this one is so shifty, it was hard to narrow down which pictures to use, so I figured I’d go with the “all of them” method. Plus, I went wild and took a video, which you can see over on Instagram. I’m not sure why, but I was expecting this polish to require some extra skills in order to apply and have it look nice, but it actually applied really easily. It’s completely opaque at two coats and dries fairly quickly. I used a coat of G&G HK Girl top coat over top to make it extra shiny. All of the pictures are indoor, in varying degrees of indirect sunlight and artificial light (graduate student in December = borderline Gollum/Smeagol existence). The formula is on the thinner side, which works really well with the fatter, shorter brush (disclosure: I have the “mini”, so I can’t vouch for the brush on the regular size bottle). Even though the base of the polish (in which I imagine the chrome-y parts magically float around) is an ominous gray, removal is extremely quick and easy. 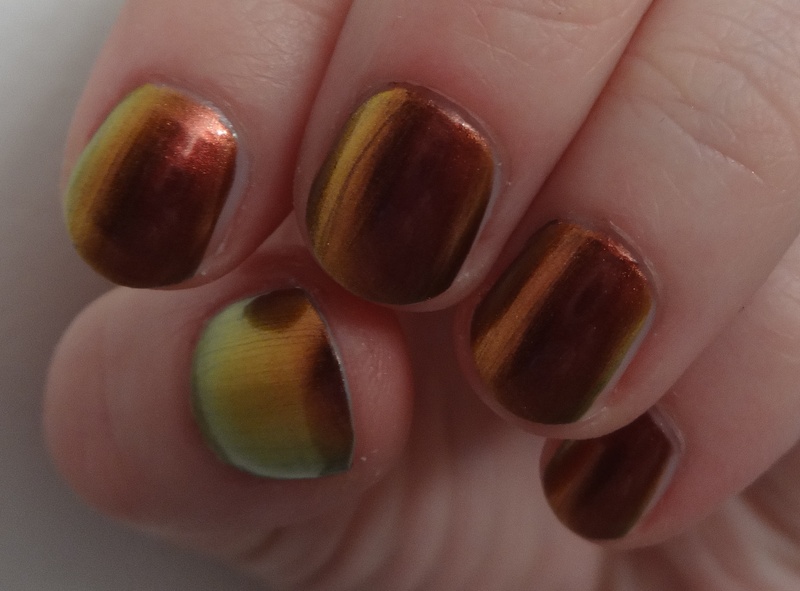 Like I said, I was anticipating that this would be Nail Polish Level: Advanced, because it looks so cool, but it turned out to be deceptively easy. 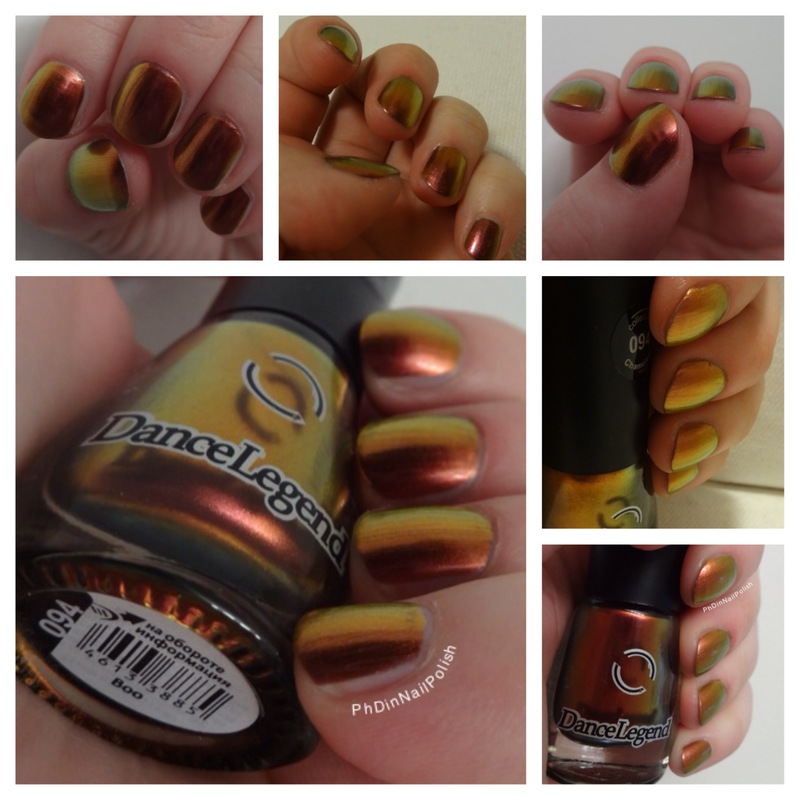 This polish can be purchased directly from Dance Legend, but since it comes from Russia (where the company is located), shipping can take a very long time. For speedier arrival times (and the thrill of the chase), you can get Boo from Llarowe. The best part is that this little beauty isn’t super expensive- it retails for $8, which means it’s about the same as an Essie or OPI (which also means that it’s way easier for me to justify impulse-buying). 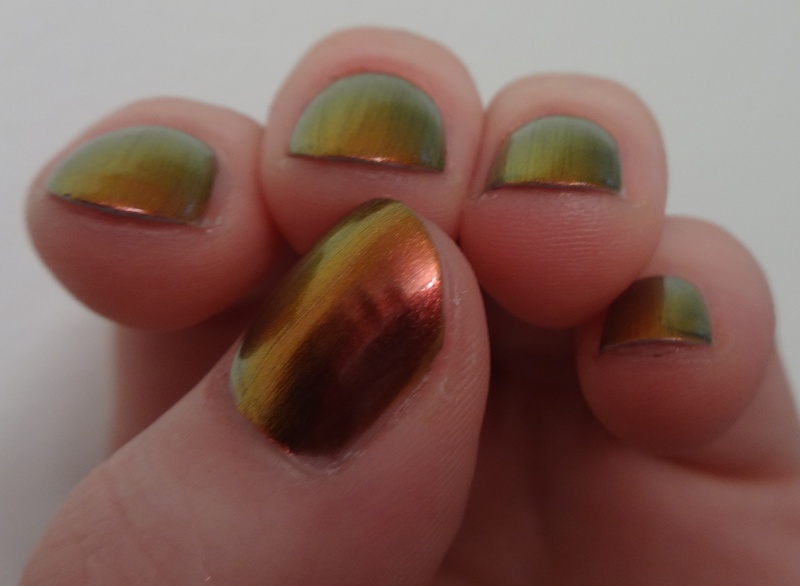 If you’re as hooked on this whole coppery, shiny, shifty thing as I am, you might also be interested in a new release from the brand I Love Nail Polish called “Nostalgia“. I saw it, and immediately wanted it (precioussss) , but I think it might be similar enough to Boo that I don’t need them both (who am I kidding, I need them all). Just in case you don’t have either (or are considering becoming a Level 5 hoarder), this is a heads up.